ETY Plugs are the world’s highest fidelity non-custom earplugs. They reduce most noise to safe levels while preserving the clarity of speech and the richness of music. ETY Plugs are configured to replicate the natural response of the ear canal so that when sound enters the earplug, it is reproduced unchanged, exactly the same as the ear would hear it, only quieter. * All ears are different. It is impossible to predict the size of an ear canal by the appearance of the outer ear, or by a person’s physical size, age or gender. Two sizes of ETY Plugs fit almost 100% of ear canals. Recent studies of both fit and seal, conducted at Etymotic Research and an independent lab, showed that the smaller of the two sizes fits the majority of ears and is now designated as standard fit. 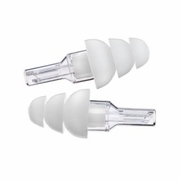 ETY Plugs are reusable, but with repeated use, the eartips may lose elasticity. For best performance and retention, if you use your ETY Plugs constantly, consider replacing them every 3-6 months. All plugs are large size except the baby blues (small).